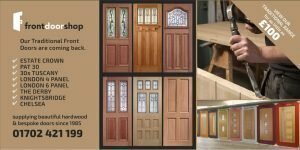 Front door shop is one of the UK’s leading suppliers of oak front doors and frames. To complement our current range of traditional doors we also have a bespoke premier range, manufactured in-house by our skilled joiners and fitters. Wooden front doors are our passion our reason to get up in the morning. It is our pleasure to make a front door and the frame, add all the locks hinges etc, to see it open and close smoothly still gives us a sense of deep satisfaction and pride in what we do. We have been making and supplying wooden front doors for more years than we care to mention and much more to come. So we thought we would offer you the benefit. But we still love it, eastern euro oak from Poland, Croatia, Ukraine very cold climate countries these Oaks tend to be very straight grained and show a colour spec of a silver nature in the wood grain. Whereas French and German oak is clean with a straw colour, I often refer to it being of a blonde colour as customers often ask the difference between hardwood/mahogany, and white oak. Both the materials are excellent for making front doors and windows. English oak tends to be asked for very very occasionally, I believe it to be a very descriptive appearance with more of a floral flare to the growth of the grain. The Front Door Shop carefully hand pick our wood materials from our timber supplier. I am sure the owner of the timber yard ‘cuss’ me on occasions as we are particular with our selection of oak timber boards. As they all come in random width boards, these need to be checked for shakes, Knots, defects and also sap wood this is at a cost of our time and labour. But it does give pay back to ourselves in the workshop. We know the wood will cut well, look well, and give us the desired look for the job, or your job really as it’s your door we could be making. We try to put the front door together in a basic design as this will hold all the sections straight as they can move when cut and give the occasional bow but with the correct procedure, it all pulls together giving a good appearance for the entrance door you want for your home. A thumbs up from Billy Byrne from DIY SOS on BBC 1! Not Just a Door Supplier! Our joiners will not only bespoke manufacture your wood door we will also supply hinges / locks complete with glass and door frames as well as deliver and fit. We truly are a one stop shop for all your external door needs. 12 month warranty – subject to maintenance terms. Bespoke made by our in-house joiners / fitters. We will guide you through the most suitable wooden door for your home. Front door shop takes pride in giving correct professional advice, we will not just sell a door for the sake of a sale. The glass in all our oak front doors is produced with safety toughened glass. We can supply plain clear, leadlight, or opaque. At front door shop in particular our bespoke side lights can be sandblasted, some with clear borders or with a house name or the home number clear in the sand blasted panel or vice versa. The choice is yours, all our glass conforms to building regulations. Please call us today you will not be disappointed with the result. Call us now on 01702 421 199 and ask to speak to Brian.